Department of Transportation Secretary Art Tugade, National Economic Development Authority Sec. 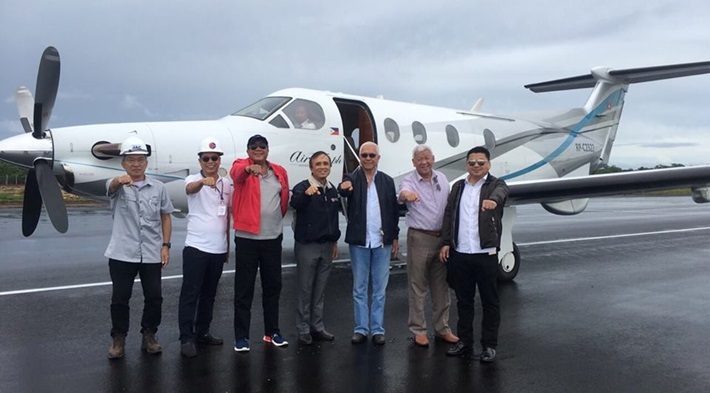 Ernesto Pernia and Cabinet Secretary Jun Evasco inspect the New Bohol (Panglao) International Airport, which is expected to be completed in June 2018. A small aircraft carrying three Cabinet members successfully landed on the 1,800-meter runway of the Panglao Bohol Airport in what was the first flight conducted at the still under construction facility. The private plane arrived at the airport in the resort town of Panglao from Metro Manila at 10:20 a.m.
Department of Transportation Secretary Art Tugade, National Economic and Development Authority Director General Ernesto Pernia and Cabinet Secretary Leoncio Evasco Jr. were on board the flight. According to Tugade, the test flight was conducted to check if the runway was already usable a year before commercial airlines are expected to use the facility. The secretary also delivered on an assurance he made to Gov. Edgar Chatto last month that he will be returning to Bohol to personally inspect the airport together with Pernia and Evasco. The three Cabinet members were welcomed at the project site operations center by Chatto, acting Provincial Administrator John Boiser, Ae Damalerio and Fernando Borja, a special envoy to China. They were also joined by Japan Airport Consultant project manager Tadashi Aoi and Chiyoda Mitsubishi Joint venture project manager Aisuke Ando.